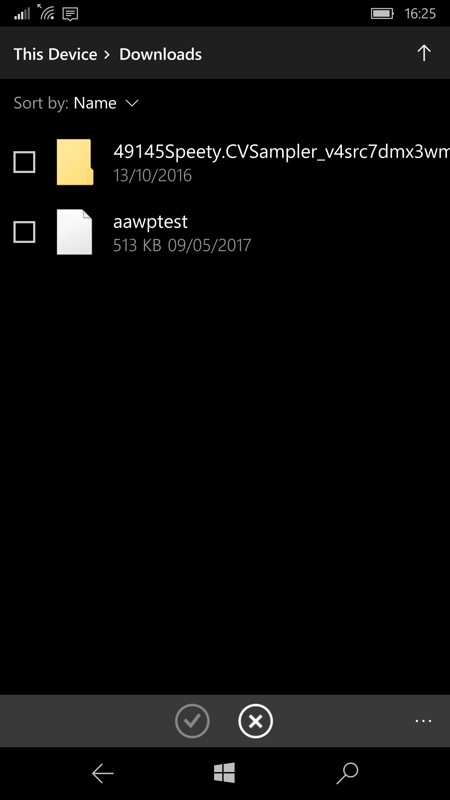 One somewhat mysterious application has been in the Creators Update for months and I suspect that many of us have steered well clear, being unsure exactly what to do with it. There's nothing to be afraid of, as it turns out, 'View 3D Preview' does exactly what it sounds like it does. 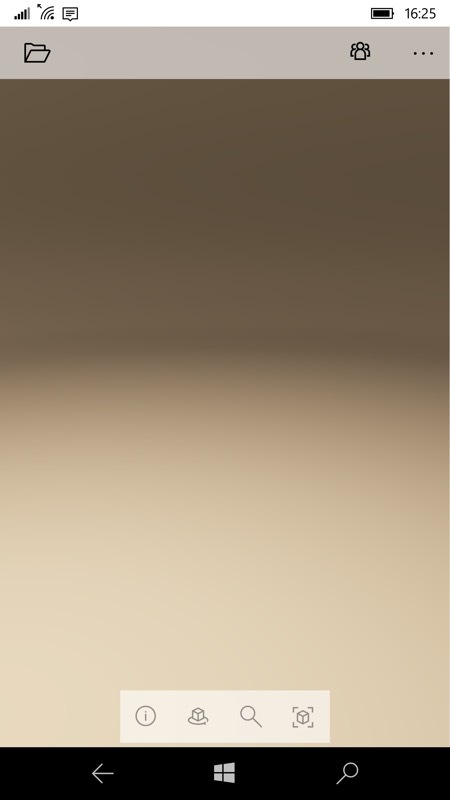 It lets you - ahem - view 3D models. And Microsoft hasn't finished fiddling with it yet, hence the 'Preview' bit. Here's how it all works, anyway. 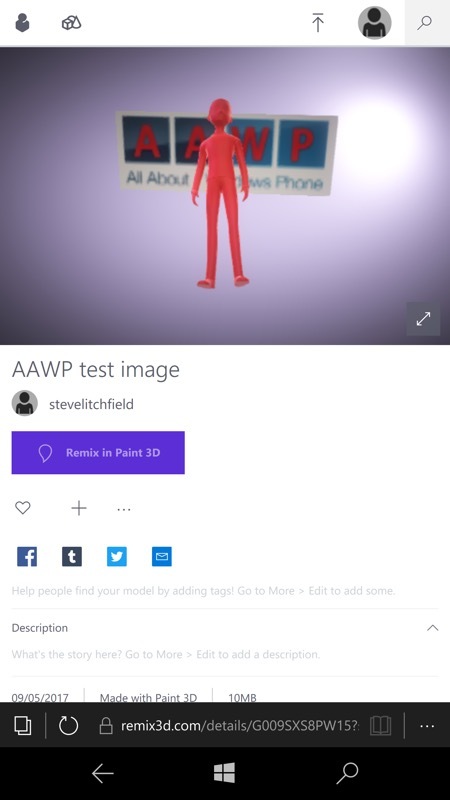 I should preface this feature with a comment or two on there not being a version of Paint 3D for mobile - or at least not yet. In fairness, the UI for Paint 3D is (relatively) complicated enough as it is, in terms of controls, sliders and so on - it would be a genuinely impressive undertaking to get the application just as useable on a 5.2" phone screen. Could it be done? Possibly - after all, Office Mobile is exemplary here, but I doubt that getting Paint 3D reworked to auto-handle phone displays is a priority for Microsoft. And after all, creating 3D models is really a desktop/studio thing, you're not going to be knocking anything non-trivial up on the bus home from work on your phone! 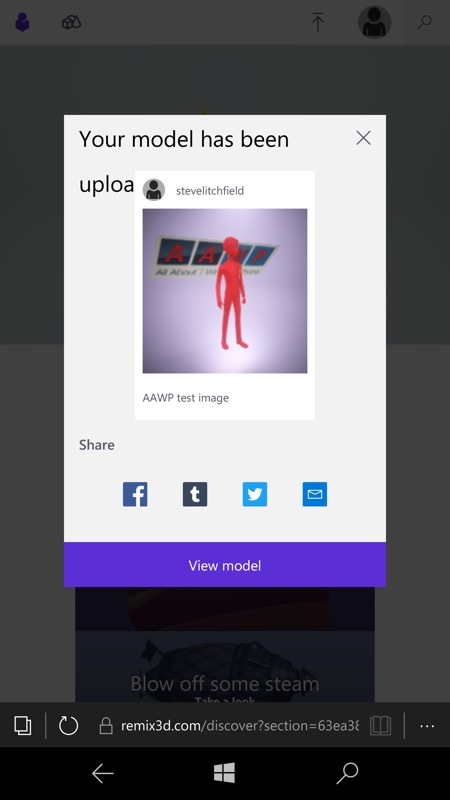 Having a viewer for 3D files does make sense on the phone though - this way, a friend could email over (or share via OneDrive, etc.) a model they've been working on and you can spin it around and see what you think. All part of Microsoft's Creators Update world - and quite impressive at that. Just to show the workflow, I'll make a trivial model in Paint 3D on my Windows 10 Creators Update-running Surface Pro, save it to my OneDrive, and then open it up in View 3D on my Lumia 950 XL, before re-uploading it to the Remix 3D model sharing site (run by Microsoft). It's easy! Yes, a trivial example, but it'll do. 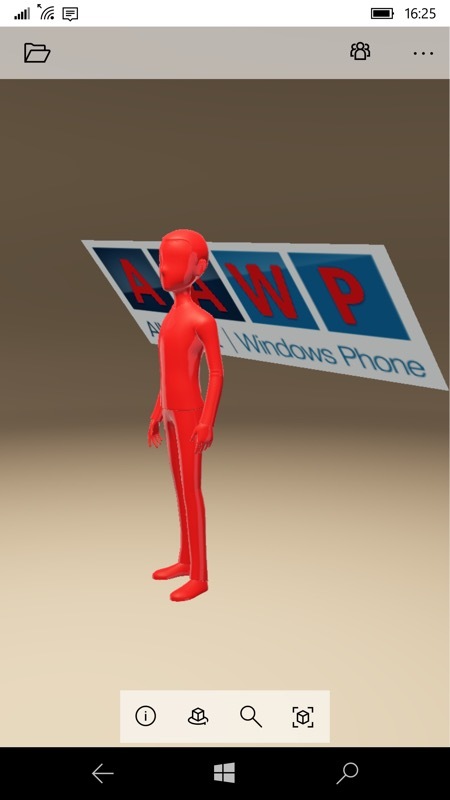 The AAWP logo, converted into '3D' by Paint 3D and then one of the supplied 3D objects inserted in front of it. 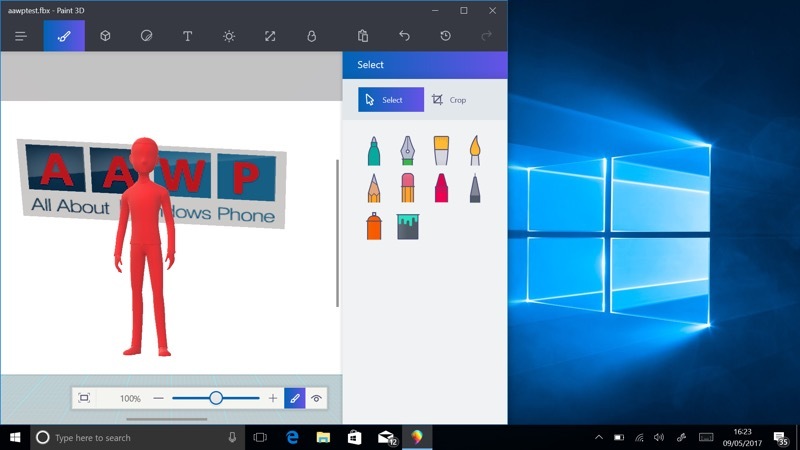 See other sites and tutorials around the Net for how to use the desktop Paint 3D application. I saved it as a '.FBX' file to my OneDrive (though View 3D also accepts STL and 3MF formats/files). 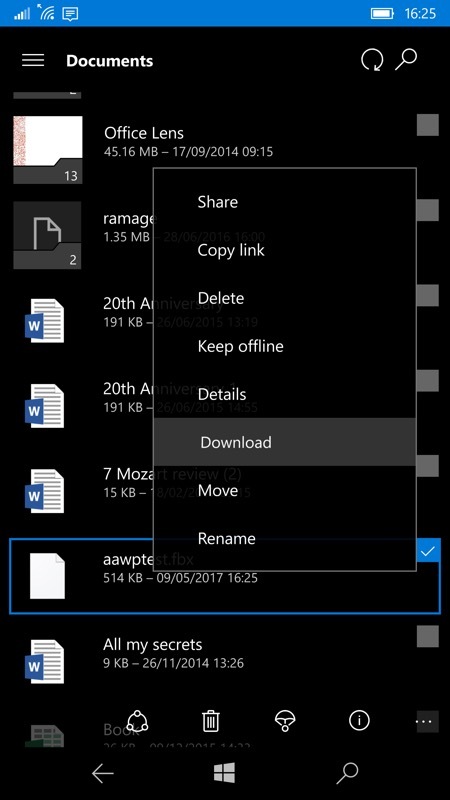 Here I'm downloading the FBX file from OneDrive, to my phone, though you can also access it directly from the Cloud from View 3D's 'open' icon, top left. 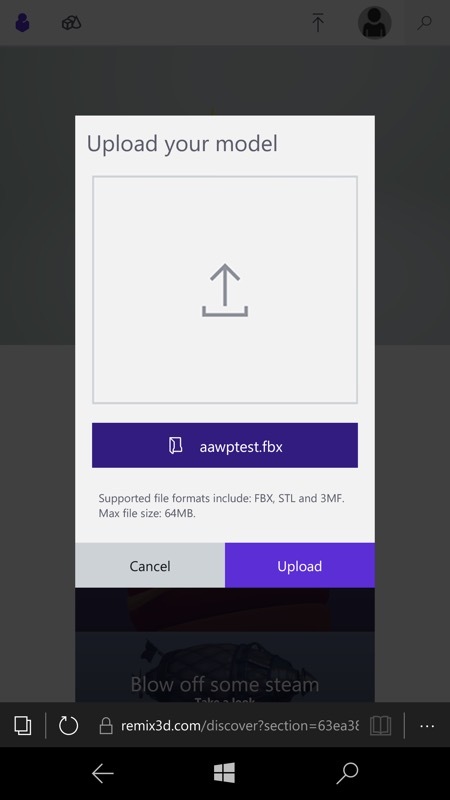 Pick the FBX file and after a few seconds it'll be spinning on your phone screen! Tap to take control of the movement and have fun etc. 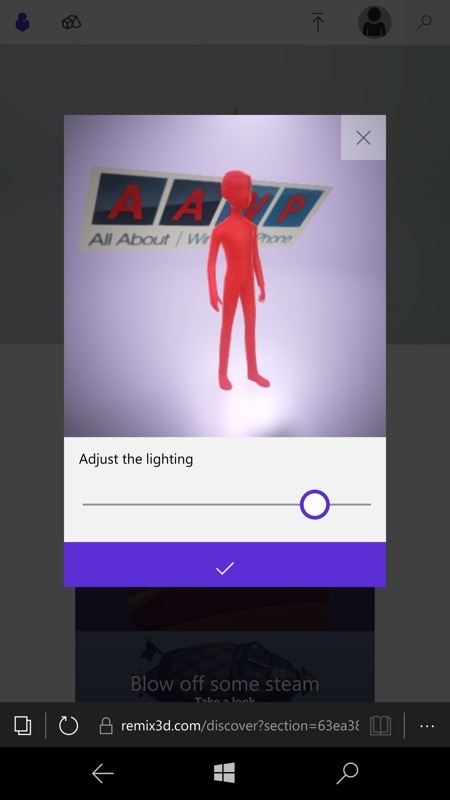 There's more though, if you follow the link in View 3D through to Remix 3D - here filters and lighting can be applied with one tap and that can have a surprisingly professional effect, as seen here. Once on Remix 3D, you can share your model/project with others - they can they import it into an existing (or new) project of their own. Hence the 'remixing'. I know it's trivial, but if you want something to look at, then the example 3D model above is here and the Remix 3D-shared version is here. The workflow is surprisingly seamless, considering that built-in 3D modelling on a consumer OS is very new. You have to think that a small team in Microsoft is even now figuring out ways to optimise Paint 3D for mobile too - with the touch interface it could be very workable, though perhaps only on 5.7"+ screens, so think phablets like the 950 XL and Elite x3. Comments welcome if you've played with any of this!